Can you easily perform queries over your data in many different ways, perhaps in ways you have never anticipated? Are you able to visualize your logs in multiple ways while supporting instant filtering based on time, text and other types of filters? You don’t always need a fully functional database for every project. If you’re prototyping and your data model is still changing, chances are you could use a Google Spreadsheet for easier and quicker set up. .NET Core 1.1 – Where to start? Hi, as you may notice, the version .NET Core 1.1 changed some significant things like the new command of CLI options, the project settings now is made through a XML format instead of JSON and the back of the CSPROJ extension. Often you'll find that you want to return more than one value from a method. If you really are just returning two pieces of data, without any associated behaviour, then the new tuples added in C# 7 are a great fit and this article may be helpful. 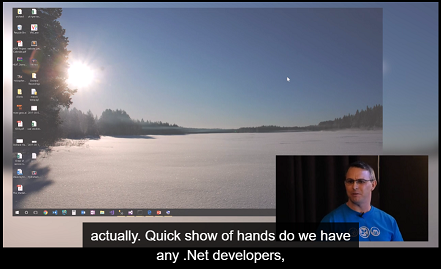 NET Standard 2.0 will initially be supported by .NET framework, the Xamarin platforms and .NET Core (this includes UWP, which is implemented on top of it). The set of APIs in .NET Standard 2.0 should be much larger than the existing set in .NET Standard 1.6. In this post, I’m going to show you how Visual Studio Live Unit Testing works, as well as some thoughts around using unit tests vs integration tests. You can follow along by getting the full source code for this Live Unit Testing example on GitHub. Orchard CMS is an open source, community-driven, content management system built on ASP.NET. But that's so last week. In this talk, we'll have a look at Orchard 2 (or Orchard Core, built on the ASP.NET Core platform) and some of its features, plus a sneak peak of what's going on behind the scenes. The Nexmo SMS API lets you send and receive text messages around the world. This tutorial shows you how to use the Nexmo C# Client Library to send SMS messages from your ASP.NET MVC web app.